One often thinks that so called legacy carriers like United or Lufthansa must be a benchmark of the service quality and our personal safety. They repeated it so often themselves that they start to believe it and stop working on improvement. Most people book on the big well known airlines until they hit a roadblock. The seats are not available for the dates we want, a connection requires a different carrier or quite simply nobody else but that lesser known airline flies where we want to go. And then, voilà. 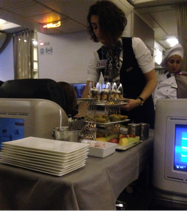 We are booked on Turkish Airlines from San Francisco to Addis Ababa via Istanbul. In business class to boot. The pleasant surprises start already at the airport. The Turkish Airlines lounge is not crowded as we are used to with United in particular. There is actually real food available in large quantities, not just a few scarce non-perishable items. And staff, too who actually chats with you, up to the point when you almost start to feel that they actually care! And hot showers? Yes, I should not forget that. Wonderful to make you feel like a decent human being during layovers after a long overnight flight. Space is always in short supply on the planes and this new, spacious kind of lounge makes your transition from check in and security lines to a ten-hour plus torture on board a little easier. Before you fill your own space and adjacent real estate on both sides of seven feet of flats (beds?) and your mind and body get a healthy break of sleep over Atlantic, there is more happening in the darkness over Oklahoma. One of the chefs comes in to collect orders from a long list of items not just for dinner but also for individual orders for breakfast. Great idea for those of us whose brain would stop to function in those transitional hours when you can hardly distinguish whether you are still on the Pacific West Coast or already above Eastern Mediterranean. 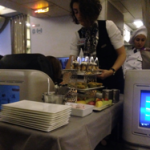 Then the delicious dinner is served freshly cooked and piping hot, followed by sweets or deserts (yes, baklava was served as it should be on any Oriental Airline), fruit plates, cheese board (no Monterrey Jack available, thank you!) and strawberry ice cream. Oh, did I tell you they also serve freshly brewed espresso and cappuccino? 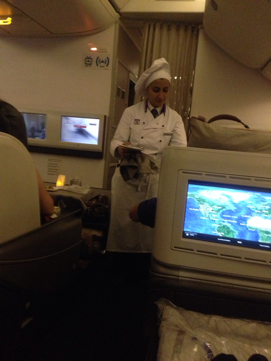 When I woke up at five o’clock in the morning Pacific Time there was a flight attendant, less than half the age I am used to with United crew, asking me if I wanted espresso OR cappuccino. So after I changed from my pajama back to my travel outfit I enjoyed the welcome feeling of caffein spreading through my veins in my body refreshed by long, comfortable sleep in a flat bed and I could truly dig into my freshly cooked breakfast. And I had to decline fried eggs over-easy. Way too much! It should come as no surprise that Turkish Airlines were the Best Airlines in Europe three years in a row. And we were not even in the First Class. Not because we did not want to be. Simply, this plane did not have the First Class, just Business. Now, I can hardly speculate how their First actually looks like. But I am sure Kobe Bryant sits next to you. We finished our breakfast just in time to start our descent into the sunset over Istanbul, another hard task awaiting us. We have less than half an hour to catch our flight to Addis Ababa. Well, since we were among the first passengers out, he did not have to play the Dutch windmill any longer but instruct us to follow him. We started running towards the gate on the other side of the airport, so far away that if it were not for this guy, there was no way we would have made it. He took us to the front of the security line (here, like in the US, even my belt and watch goes into the TSA bin), with other passengers giving us dirty looks and then we were running through the crowded Atatürk Airport reminding me of a duty free and high end brand names shopping mall, as it is now the case with most civilized airports around the world. We reached our gate at 6:30pm, just 15 minutes BEFORE our scheduled departure where we were the very last passengers put on a tarmac bus and ferried to our plane. We made it, but no way in hell will our luggage. 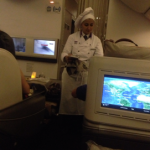 Who cares when a gorgeous flight attendant is leaning over you pouring you a glass of champagne! Here’s to Turkish Airlines!